Discover the luxurious and unique design of the Galaxy Tab S3, combining metal and glass, characteristic of the flagship Galaxy. The glossy glass on the back surface demonstrates the richness of the color depth, thus creating a modern appearance that is complemented by strong and strong metal. Powerful processor Snapdragon 820 and 4 GB of RAM allow you to easily perform complex tasks, provide work with multiple applications at the same time, the ability to play the most modern games. The high-contrast Super AMOLED screen ensures accurate transmission of the entire color range. Wherever you go, the Galaxy Tab S3 will fill your space with high-quality sound. This is the first Samsung tablet with four adaptive speakers, thanks to which you will be able to multichannel sound, even on the go. Advanced speaker system will give you a rich sound absolutely from any position of the tablet. If you flipped the tablet - the audio stream will also be redistributed to other speakers. Thus, the sound always matches the picture. The Galaxy Game Launcher feature is optimized for the Galaxy Tab S3 tablet screen and includes options such as "Power Saving Mode", "Downloadable Game with Network Upload", "Silent Game" and the option "Support for Current Calls". Add to the existing graphics capabilities Vulkan API to support 3D graphics, as well as numerous games from the collection of Galaxy Game Pack, and you will get fun in the "non-stop" mode. The new S Pen looks and works like a real pen. The design of the pen tip allows you to experience the same sensations as when writing with a pen on paper. The S Pen itself does not have a built-in battery, which made its design and weight ideal. Pen Pen has changed significantly. Now, using an electronic pen, you will experience the same sensations as when using a familiar pen. Using S Pen is very easy and simple. You can edit images, do video editing or translate text. In addition, S Pen does not need to be recharged, which saves unnecessary worry. Also, it became possible to use S Pen in graphic and music applications, in which you will be able to fully express yourself. You can easily make reports, even when you are on the road. Together with Samsung GALAXY Tab S3. Simply connect the keyboard to the POGO connector without additional settings, and the layout of the keys will ensure maximum convenience for printing. Thanks to the battery 6 000 mAh you will enjoy your pastime for as long as possible. Look at more movies, play more games and listen to more music. 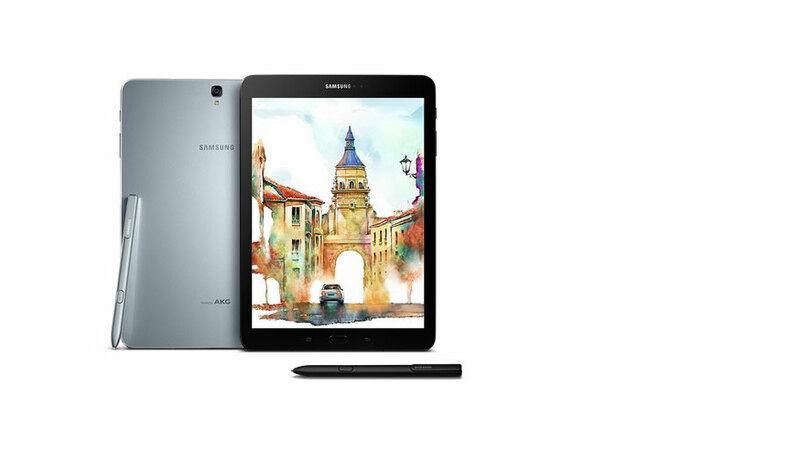 Full charge Galaxy Tab S3 allows you to play videos over 12 hours *. The charging time is also significantly reduced due to the presence of fast charging.